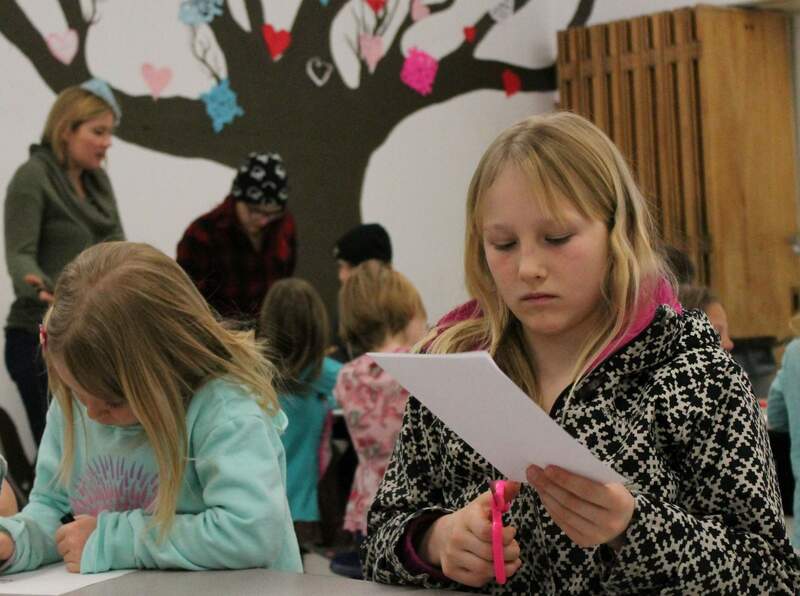 Ruby VanBuskirk, 9, a third-grader at The Juniper School, cuts out a heart at a Sources of Strength activity led by Big Picture High School students in a cafeteria shared by the two schools. During the activity, elementary school students were asked to draw what they think about or do to make them feel better when they are sad. 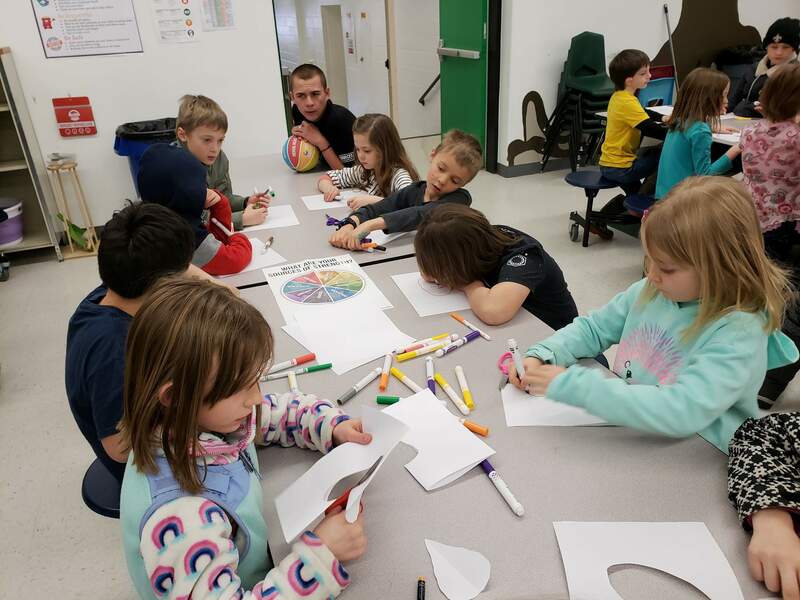 While crafting decorations for a Tree of Life mural in a shared cafeteria, Big Picture High School students encouraged The Juniper School elementary students to think about how they deal with sadness. It’s an effort to promote emotional and mental wellness while giving students the tools they may need to navigate crisis. “If I’m mad or sad, I could take a deep breath,” said Ruby VanBuskirk, 9, a third-grader, while cutting out a paper heart for the mural. A nearby student, Abigail Reeder, 7, drew her stuffed bear named Safety on her heart cutout. The heart activity was built on “knowing about what you really care about, what really fills you up inside,” said Chantey Webbe, an English teacher and the high school Sources of Strength adviser. Jacob Schultz, a senior at Big Picture High School, talks with students from The Juniper School about how they cope with feelings of sadness. The activity was held in a cafeteria that is shared by both schools as part of a Sources of Strength campaign. Sources of Strength is a suicide-prevention campaign that emphasizes leaning on social strengths, such as family, friends, mentors and generosity. The heart activity held last week is one of several Sources of Strength campaigns Big Picture High School students have put on to promote understanding of eight social factors that individuals can lean on to overcome abuse, trauma and other personal struggles. The evidence-based program promotes mental health, family support, positive friends, mentors, healthy activities, generosity, spirituality and medical access. “The big mission for this program is to focus on strengths and hope or even stories of strength and hope, rather than stories of trauma and despair,” she said. The focus on healthy coping methods, Webbe said, has proved to be empowering for students. The program was introduced this fall in Durango, Bayfield and Ignacio high schools. Middle schools in Durango School District 9-R also adopted the program. Aside from Big Picture, all the other secondary 9-R schools have hosted one Sources of Strength campaign and aim to hold a second one before the end of the year, said Leah Tanke, coordinator of school counseling. The Colorado Attorney General’s Office offered La Plata County schools a grant to fund the program because of the rising number of reports about threats of suicide to the statewide Safe2Tell hotline. The hotline is promoted by local districts as a way for students to anonymously report serious concerns, such as suicide, bullying and drug or alcohol use. Big Picture High School students and English teacher Chantey Webbe hang decorations for a Sources of Strength campaign aimed at helping students deal with sadness. 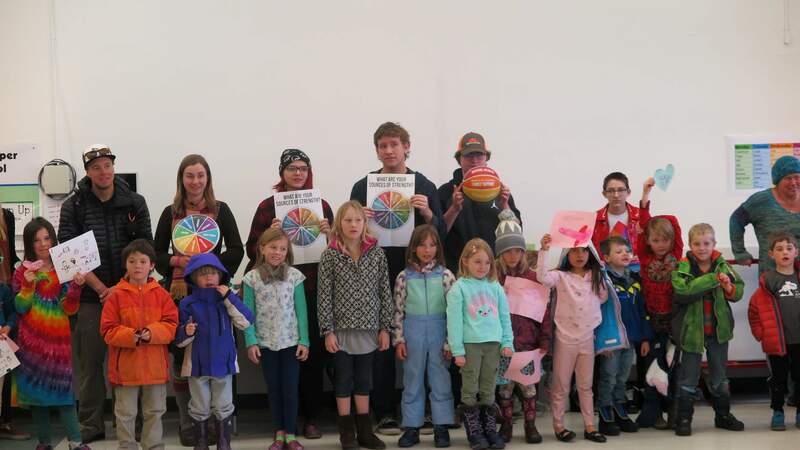 Students with The Juniper School, a charter elementary school, made the decorations with direction from Big Picture High School students on Friday. Sources of Strength appealed to Big Picture High School students for its emphasis on positive influences, they said. “Suicide prevention programs have always been super hard for me to deal with because they are so down,” said Rainey Scott, a sophomore at Big Picture. All Sources of Strength campaigns are run and developed by high school students, known as peer leaders, who are recruited from diverse social groups. 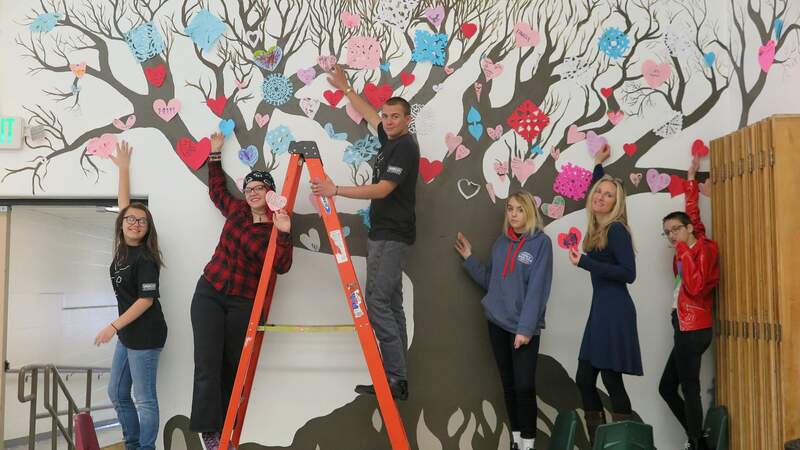 For Sources of Strength, Big Picture students painted the Tree of Life mural in the cafeteria. It has been at the center of several campaigns, Webbe said. It was decorated as the Tree of Thanks in November and the Tree of Giving in December, she said. “It symbolizes hope and strength and durability,” she said. The tree was decorated with snowflakes and hearts during January and February respectively. Students wrote a New Year’s resolution on the snowflakes, she said. Younger elementary students in kindergarten through third grade made hearts decorated with items and people dear to them, she said. At Bayfield High School, students have planned campaigns around thankfulness and trusted adults, said counselor Jennifer Leithauser. For example, they wrote prompts on the school’s windows asking questions such as “Who is someone that you are thankful for?” and allowed others to answer the question, she said. Through the program, students are gaining a common language to discuss mental health with adults and help support their friends, she said. “It makes the conversations easier to have so they happen earlier and more often,” she said. Last year, Leithauser said Bayfield High School staff worked with students in crisis, and the number of students in crisis declined. Students can meet with a therapist from Axis Health System who visits the building each week, which has helped, she said. “Students are coping better,” she said.